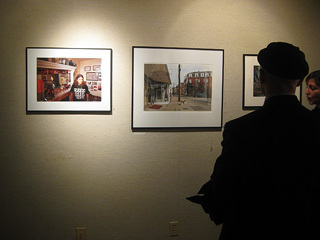 Tonight we attended the opening reception for the West Hartford Art League's 15th Annual Open Juried Photography Exhibit called "Exposures", which was juried by none other than Tod Papageorge, Director of Graduate Studies in Photography at Yale University's School of Art. His students have included Philip-Lorca diCorcia and Gregory Crewdson, both of whom have influenced my work, let alone the photos I submitted for this exhibit - "Stacey", "Heather", "Ed" and "Jimmy". I hadn't even heard if my work had been accepted, so I was quite thrilled to get a message today that I won an award. Apparently there were 352 submissions, and Papageorge chose 56, even less than the director's requested 75 - and two of my photos were accepted! Yay! "Heather" and "Stacey" are currently hanging in the Clubhouse Gallery. I came in 4th out of 7 award winners. During the award presentation, when asked which photo won, I actually pointed to the wrong one. Doh!! We hadn't gone through the whole exhibit yet, so it didn't occur to me to look for the label under the award-winners. 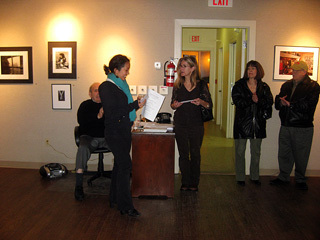 So, I pointed to the one I had already seen - "Heather", the first photo in the exhibit, when "Stacey" which was placed in the back of the room won the award. I didn't realize it until Brian pointed it out, and there was a small window when I could have corrected myself, but I missed it. I felt pretty dumb afterwards. We had the obligatory wine with cheese and crackers as we admired the art. A couple women mentioned William Eggleston, and Brian was happy that he knew who they were talking about. It was definitely a nice time, talking with other photographers and asking about their work. 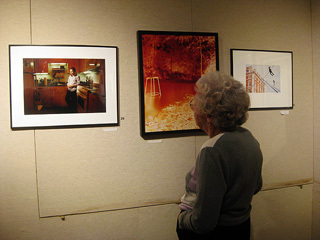 The woman who won Best in Show had a beautiful image using Ilford SFX film.